John Tabor is a sailor who does nothing but annoy and complain to the rest of the sailors on the ship. One day he stumbles upon a whale who gives him the rockiest ride of his life. He never complains again. 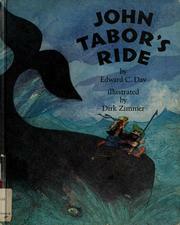 Day, Edward C., “John tabor's ride,” Children's Picture Book Database at Miami University, accessed April 21, 2019, https://dlp.lib.miamioh.edu/picturebook/items/show/7456.